“Who draws the line?” is the title of the first solo exhibition in Italy by the Turkish artist Devrim Kadirbeyoglu, co-produced by Archiviazioni and Ramdom Association. The exhibition was born as an inner necessity of the artist to represent and communicate the human, financial and social extent problems concerning the Schengen visa requirement for Turkish citizens. This is implemented through a site specific installation which paradoxically becomes itself a mobile project: after having traveled in the Northeast of Italy in search for a context of where to be discussed and presented, subjected to several conceptual and aesthetical elaborations, he finds home at the spaces of Archiviazioni and the Laboratory of Art and Architecture in Lecce. This part of Southern Italy is widely known as land of emigration. The Big Rabbits are made from recycled plastic bottles. After the installation is finished, the prolific and cutting-edge art studio destroys the installation and recycles it into a new animal and another project. The Big Rabbits recycled art Installation from Cracking Art Group in Italy has been turning heads across Europe. 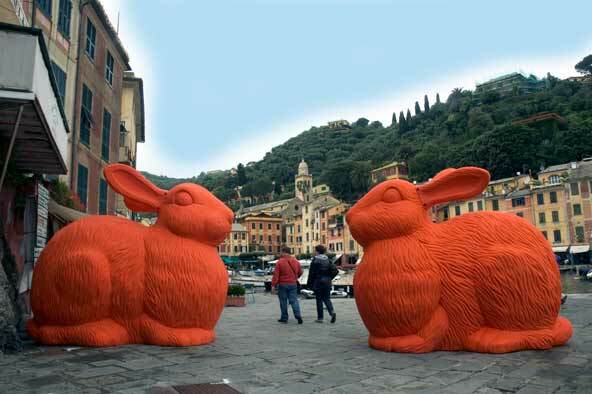 The recycled orange rabbits have been on display in Portofino, Milan, Prague, Paris, Brussels and San Remo. via Big Orange Recycled Rabbits.